Patagonian Explorer – 4 Nights – The Great Canadian Travel Co. Journey to the end of the world beginning in Ushuaia and ending in Punta Arenas! 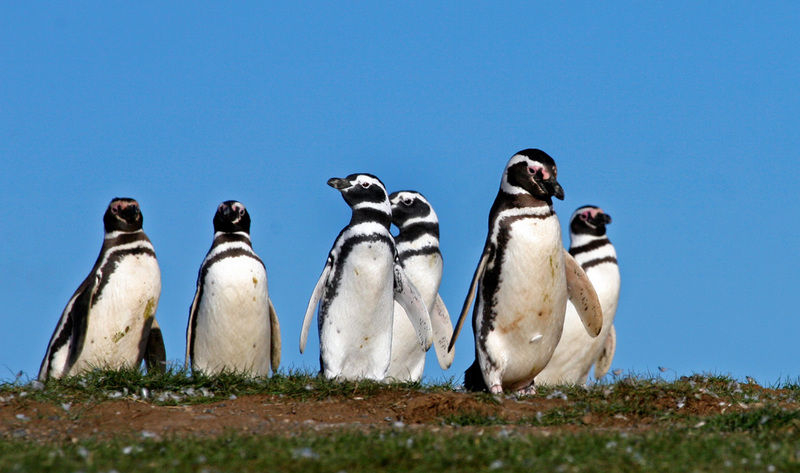 This route shows you the splendor and beauty of Patagonia’s unique wildlife and landscapes. Rates are shown in US$ per person, based on two people sharing a cabin in the category shown. Single rates are available in categories A, AA, AAA, AA Sup or AAA Sup at 150% of the category rate. Single rate does not apply to Category B. Children between 1 and 3 travel free if sharing a bed with their parents. Children between 4 and 12 receive a 50% discount, sharing a cabin with an adult. Check in at 160 Juan Manuel de Rosas Street in downtown Ushuaia between 10:00 and 16:00 and board the Via Australis cruise ship at 17:30. After a welcoming cocktail reception hosted by the Captain and his crew, the Via Australis will depart for one of the remotest parts of the planet. Our voyage will take us through the Beagle Channel to explore one of the most breathtaking wilderness regions in the world: Southern Patagonia, which includes the Tierra del Fuego archipelago. We will be sailing through Murray Channel and Nassau Bay to reach Cape Horn National Park, where, weather permitting, we shall go ashore. 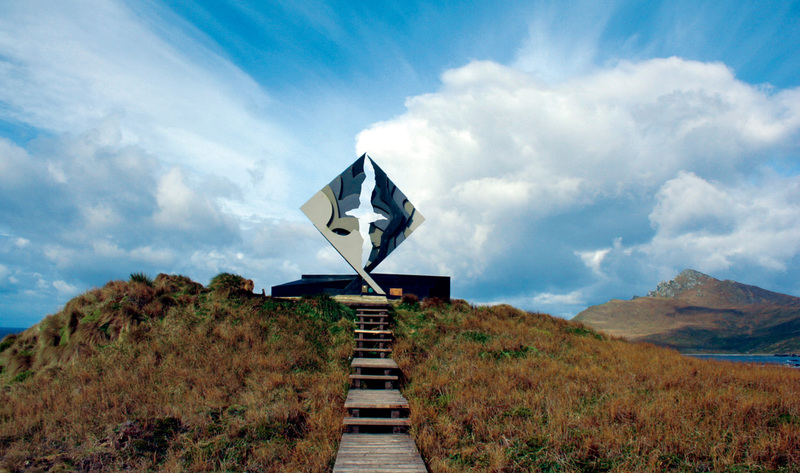 The legendary Cape Horn was discovered in 1616 and is a sheer 425-meter (1,394-foot) high rocky promontory. For many years it was an important navigation route between the Pacific and the Atlantic, and is referred to as the ‘End of the Earth’. The park was declared a World Biosphere Reserve by UNESCO in 2005.In the afternoon, we will go ashore at historic Wulaia Bay, originally the site of one of the region’s largest Yamana aboriginal settlements. Charles Darwin landed there in 1833 during his voyage on the HMS Beagle. This area is also renowned for the mesmerizing beauty of its vegetation and geography. We will take an enchanted walk through the Magellan Forest of lengas, coigües, canelos, ferns, and other endemic vegetation, to reach a panoramic viewpoint. 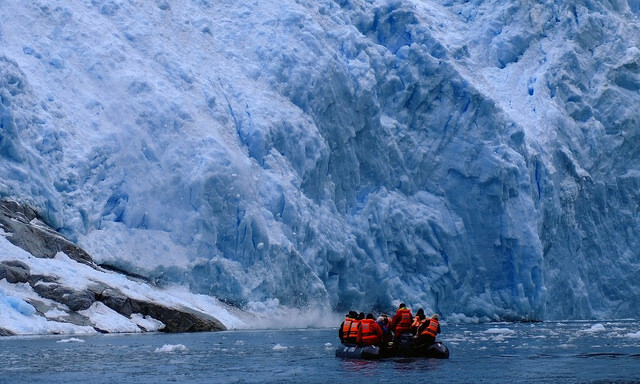 Overnight we continue our Patagonia glacier tour around the western end of Tierra del Fuego via the very narrow Gabrial Channel, Magdalena Channel and Cockburn Channel. After rounding the remote Brecknock Peninsula, Ventus Australis tacks eastward and enters the Beagle Channel again. By morning we are entering Pia Fjord and boarding the Zodiacs for a shore excursion to Pia Glacier.After disembarking we take a short hike to gain a panoramic view of the spectacular glacier, which extends from the mountaintops down to the sea or a longer much more difficult walk up a lateral moraine of the old Pia Glacier. No one knows for certain how the hulking mass of snow and ice got its feminine moniker, but one theory says it was named for Princess Maria Pia of Savoy (1847-1911), daughter of the Italian king. Making our way further west along the Beagle Channel, we enter another long fjord and drop anchor near Garibaldi Glacier for another shore excursion. 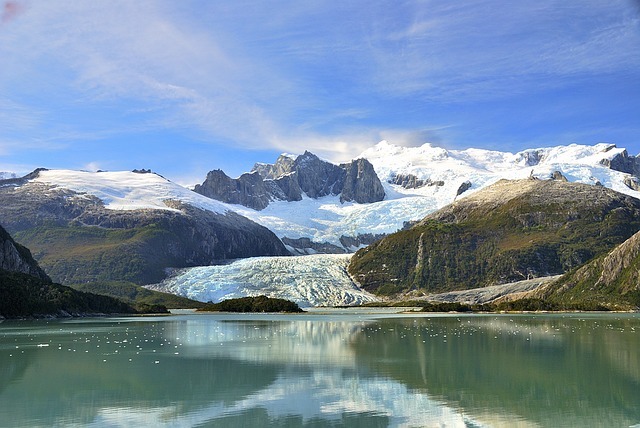 Garibaldi is one of only three glaciers in Patagonia gaining mass rather than staying the same or slowly shrinking. This time we hike through virgin Magellanic forest to a glacial waterfall, a towering wall of ferns and moss, and spectacular viewpoints looking down on the glacier and fjord. The walk is demanding — very steep, negligible trail, rough footing — and not for everyone. For those who choose to stay on-board, our captain will point the bow towards the beautiful sky blue Garibaldi Glacier so everyone can enjoy the panoramic view from the upper decks. 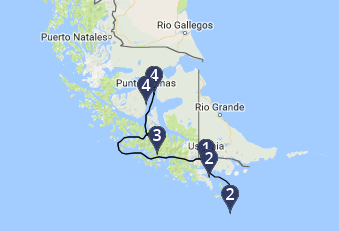 After an overnight cruise through Magdalena Channel and back into the Strait of Magellan, we anchor off Magdalena Island*, which lies about halfway between Tierra del Fuego and the Chilean mainland. Crowned by a distinctive lighthouse, the island used to be an essential source of supplies for navigators and explorers and is inhabited by an immense colony of Magellanic penguins. At the break of dawn, weather permitting, we go ashore and hike a path that leads through thousands of penguins to a small museum lodged inside the vintage 1902 lighthouse. Many other bird species are also found on the island. In September and April — when the penguins dwell elsewhere — this excursion is replaced by a ride aboard Zodiacs to Marta Island to observe South American sea lions. 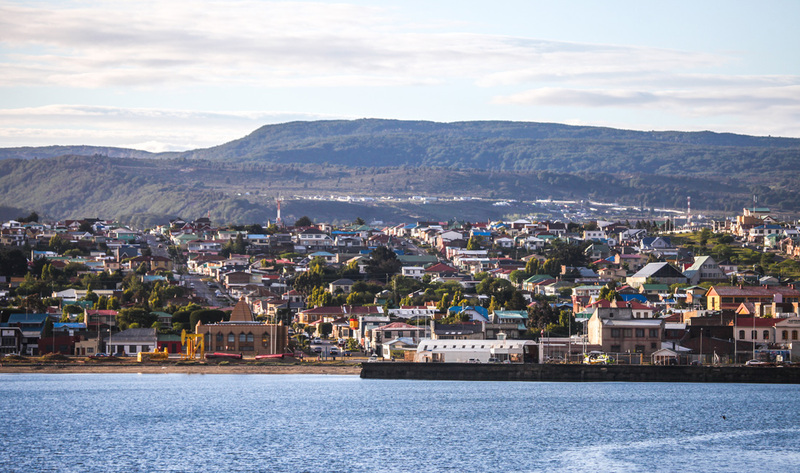 After a short cruise south along the strait, disembarkation at Punta Arenas is scheduled for around 11:30 AM. One of the industry’s most comfortable ships is designed to make your cruise excursion as comfortable and rewarding as possible during a journey down to Cape Horn at the bottom end of western hemisphere, through the scenic Beagle Channel that runs along the southern extreme of Tierra del Fuego, and across the fabled Strait of Magellan to the Chilean mainland. Along the way learn about others who have explored the same waters — Ferdinand Magellan and Sir Francis Drake, Captain FitzRoy and Charles Darwin. All the while on the lookout for whales, dolphins, penguins, condors, elephant seals and the other creatures who call this remote part of the world their home. The excursions described in the itineraries can normally be carried out, however Transportes Marítimos Terra Australis S.A., Transportes Marítimos Via Australis S.A., and Transportes Marítimos Geo Australis S.A reserve the right to reschedule, shorten, or alter all or part of the itineraries and/or excursions without prior notice in order to safeguard the well being and safety of passengers, preserve the environment, or due to any extraordinary circumstances, acts of God or force majeure. For the same reasons, the hours of departure or arrival of the vessels may be subject to change. There is no guarantee of wildlife sighting because the precise location of these animals cannot be confirmed.